Any time you have 3 or more similar objects on a slide, you may want to make them equidistant. 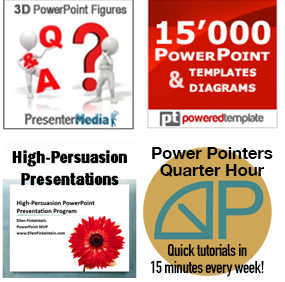 PowerPoint offers 3 separate ways to create equidistant objects. 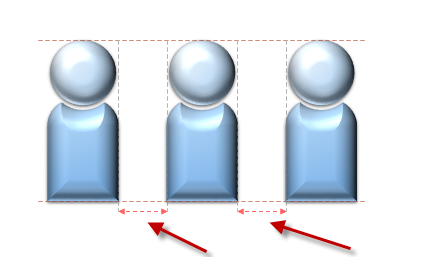 Select the object and press Ctrl + D. PowerPoint duplicates the original object and offsets the 2nd object slightly in both the X and Y directions. Move the 2nd object into place by dragging it or using the arrow keys on your keyboard. Make sure you get it exactly the way you want it. Don’t do any other action on the slide. Press Ctrl + D again as many times as you want. PowerPoint remembers the distance and direction between the first 2 objects and creates a perfect line of objects for you! Select all of the objects. To select multiple objects, click and drag a selection box around them or click one, then press Ctrl or Shift as you click the rest. 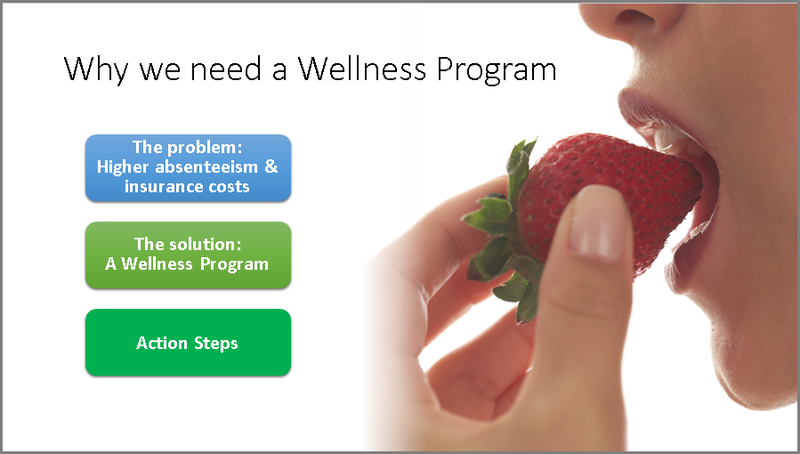 On the Format tab, click Align in the Arrange group and then choose Distribute Horizontally or Distribute Vertically, depending on your needs. Set the distance of the 1st two objects by moving the 2nd object to the desired location. To make the 3rd object equidistant to the 1st two, drag it until you see the equidistance markers. Now you have no more excuses for sloppy slides with objects that aren’t exactly equidistant! I´m sorry, this tip does not work in my Spanish PP. Is there some equivalente Ctrl-something that could work? Hmmm, do you mean that Ctrl+D doesn’t duplicate objects? Hold down Ctrl and drag to the desired location. Then press F4. it worked for me. Thanks a lot…. It worked fine. I shall be looking for new tips. Office for Mac 2016 distributes evenly across a whole slide, but not within a portion of a slide. 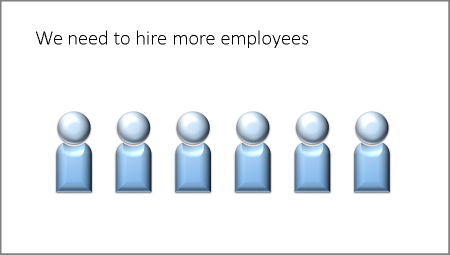 The way used work was great; Powerpoint would distribute evenly between the outer two selected objects. The procedure was to position the leftmost and rightmost for horizontal distribution objects where you wanted them (or top and bottom objects if you were distributing vertically), then select all the objects you want to distribute, run the distribute option and it always came out perfect. Now, it ignores the positions of the objects on the ends and distributes across the whole slide. I have seen reference to an click you can make to distributed relative to slide vs….. ? relative to other objects I guess, but I don’t that feature in the Mac version. I have an HP computer running Windows 10 and Office 2016, not a MAC, and I have the same problem as Dan Allen. When I use “Distribute Vertically” my objects (often times they are lines) are distributed evenly top to bottom on the page, not between the highest and lowest object. I often do not know how many lines I will have before I’m finished, so the Ctrl+D option is not appropriate for my work. If you know how many objects you will have, and know the spacing that will make them evenly distributed, then maybe Ctrl+D would be appropriate, but I will wager that most people will find that is much more restrictive than the former way. IMHO, this is another example of Microsoft assuming they know what the user wants, and in making things “easier” for the user, messing up something that worked fine before. I am using Windows 7 and Office 2017.
as in- 3. 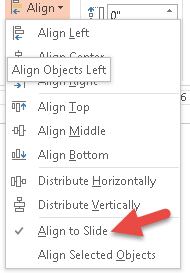 Use Equidistant markers in PowerPoint 2013. I am not getting neither equidistant marker nor alignment marker. What should I Do? Thank you so much! For me the second option was better.